In my experience, there are 2 types of books – one which you can read anywhere and not feel a step out of place whereas, for the other type, you need to ensure you are sitting at one place with all your focus, attention and energy on the book. Without a doubt, the Intelligent Investor by Benjamin Graham falls in the second category. No wonder people have read it multiple times. Only if you are certain and passionate about understanding the confusing yet potentially rewarding maze of the stock market, should you venture to read this book. 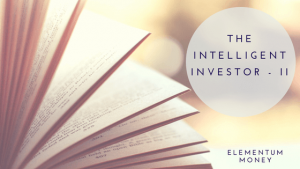 While the first half had a lot of generic information and behavior to be adopted by the Intelligent Investor, the second half is much more instructive. The book is jam-packed with information and sometimes it can be hard just to organize it in a structured manner. However, in my attempt to do so, I will talk about the second half of the book in just 3 main sections – Security Analysis for the lay investor, Stock picking for the defensive investor and stock picking for the enterprising investor. Benjamin Graham puts in this section since the lay investor should ideally be reading security analysis reports before taking the call to invest. The section tries to lay bare the main components taken into consideration while doing so. I found the Jason Zweig commentary very useful, particularly for this section and a lot of the learnings will incorporate both the authors. Zweig neatly puts in the following pointers to keep in mind. Acquiring too many companies, more than 2 or 3 a year is a sign of trouble. Look at the cash inflow carefully to ensure there are not too many unexplained cash infusions as it indicates a sick company fattening its numbers through such means. A company with a heavy dependence on a solo customer is yet another sign of potential trouble. A wide moat of competitive advantage is a good indication of a quality company. The company should also have had a long track record, at least 10 years of consistent revenue and earnings growth while spending enough on R&D to be potentially good innovators in future. Annual reports are one of the most important sources for this information area. Try to understand the tone of the words to read between the lines. One of the good gauges of management is to read past annual reports to see their forecast and then to see in the future reports whether they managed to that successfully. CEO compensation is another important consideration. Sometimes, it can blow up like the Infosys and the Vishal Sikka issue whereas at other times it might be a silent signal. The management should also be working more at their business rather than the PR machinery for the stock market. Also, check the annual report to ensure that it is actually a clean and easily understandable one as a cryptic accounting generally means there is something to hide. While a little subjective, this is one of the most instructive advice I have come across to be able to understand management quality better. As Zweig puts it – a good business is one that generates more cash than it consumes. Check if cash from operations has grown steadily in the last 10 years. Warren Buffet’s favored number here is Owner Earnings or net income plus amortization and depreciation minus normal capital expenditures. If owner earnings per share have grown by 6-7% every year for the last 10 years, then you got yourself a stable company. Also, check if long-term debt is under 50% of total capital. Benjamin Graham recommends companies with continuous dividend paying record for the last 20 years. Though I think 10 years should also make the cut. Look at the current dividend payout ratio and compare it to its peers. Personally, it seems to be a very short-term measure to me. This is a formula that Benjamin Graham is well-known for and is often also called the “intrinsic value of a stock”. Now, there are various interpretations of this formula and it deserves a post of its own. However, if you are still curious, this post about making the formula work for Indian markets was quite interesting to me. While Graham recommends companies with annual sales no less than $100 million for industrial companies and $50 million for public utilities, Zweig updates it to companies with a market value no less than $2 Billion. For smaller companies, Zweig recommends investing in a Small Cap Index Fund. In the Indian context, one of my favorite bloggers, Safal Niveshakrecommends a minimum market cap of Rs. 500 Crore of $80 Million as a screening criterion. Ensure current asset to liability ratio is at least 2:1. Long-term debt should not exceed net current assets. The stock should have had positive earnings in each of the past 10 years. Yet again Graham recommends a continued streak of dividend payment for the past 20 years. Graham recommends a growth of at least one-third in earnings per share over the past ten years using 3-year averages at the beginning and the end. So, in 2018, use earnings for 2004-2007 for the beginning and 2014-2017 for the end. However, as per Jason Zweig, this is probably a conservative estimate as it translates to a less than 3% annual rise. He rather recommends at least a 50% increase in earnings over the 10 year period as that translates to a 4% annual growth. Current price should not be more than 15 times average earnings of the past 3 years. Current price should not be more than 1.5 times the book value last reported. Alternately you can also check for a product of the multiplier times the ratio of price to book value not exceed 22.5. This takes into account P/E and P/B cumulatively allowing for some flexibility with the 2 ratios. I believe the checks mentioned for the enterprising stock investor are a little fewer as he or she is expected to check in more often and be aware. On the other hand, the defensive stock picks are more of the buy it and lock it variety. As Zweig puts it, there are many roads to Jerusalem. Use these insights and devise a stock selection policy that you are comfortable with. As he puts it, irrespective of selection technique, successful investors have 2 things in common: They are disciplined and consistent, and would not change their approach even when it seems unfashionable. More importantly, they think a great deal about what and how they are doing things but pay little attention to the market itself. Very good analysis of the book Aparna. In fact, I was recently reading a book titled “You can be a stock market genius” and I got an interesting insight out of that book on how to judge value bets. Always look out what the insiders are doing. e.g. Companies where CEOs stick to fat ESOP models than hard cash or where promoters are holding to the stock even in a weak market indicates a possibility of a strong business. Thanks Tushar. The suggested book sounds interesting. Will check out your post in a bit.